Get Your Website to Do the Work for You! In today’s competitive MFG market, it’s critical you aren't falling behind. We wanted to see for ourselves where manufacturing firm sites needed the most help. So PMG put 100 randomly selected manufacturing firm websites to the test. And let us tell you: the research did not disappoint. 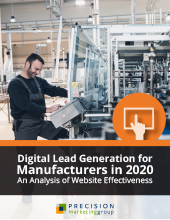 Download our report and discover 14 new data-driven ways to maximize lead gen results and create the ultimate sales tool – a website that works for you 24 hours a day, 7 days a week. Simply fill out the form to access our research study now! Note: This research study was originally conducted for 2018. Last year, we reexamined the same 100 websites and found very few changes were made. We have updated the report accordingly.